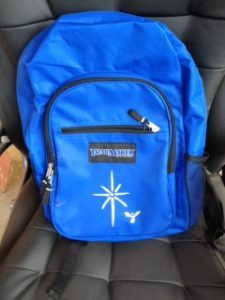 The new school bags will arrive from the US where a unique foundation has been set up to fund the supply of the bags and some essential school items for each child. The inspiration for the schoolbag project came about when a visitor to the art and craft workshop run by Sister Nazareth (Sé Na) heard Sister Nazareth tell the story of the guiding star and its place in the Christmas story. As she went on to describe how each one of us on our life’s journey is guided by a star a seed of an idea began its journey in the visitors’ mind. This tiny seed of an idea has developed into the schoolbag project whereby each schoolbag is emblazoned with its own guiding star to guide and direct each child throughout their schooling. Its a lovely idea and comes to the children with such love and a desire to encourage, support and assist them on their journey. ← Long Awaited Computer Training at last!